In restaurants and night spots everywhere, customers are enjoying the pleasures of shared foods. Rather than ordering oversized entrées, they’re choosing instead to order a platter of simple fresh ingredients and creating their own tasty tidbits. In many spots you’ll see this menued as tapas—the Spanish tradition of shared small plates. Here, we’ve married the tapas concept with our take on Mix & Match Bruschetta, which is most commonly made with toasted baguette slices with tomatoes, fresh mozzarella cheese and fresh basil. Put out a large platter, wooden board or serving dish. We used overlapping slabs of inexpensive Italian white marble, purchased at a home-improvement store. 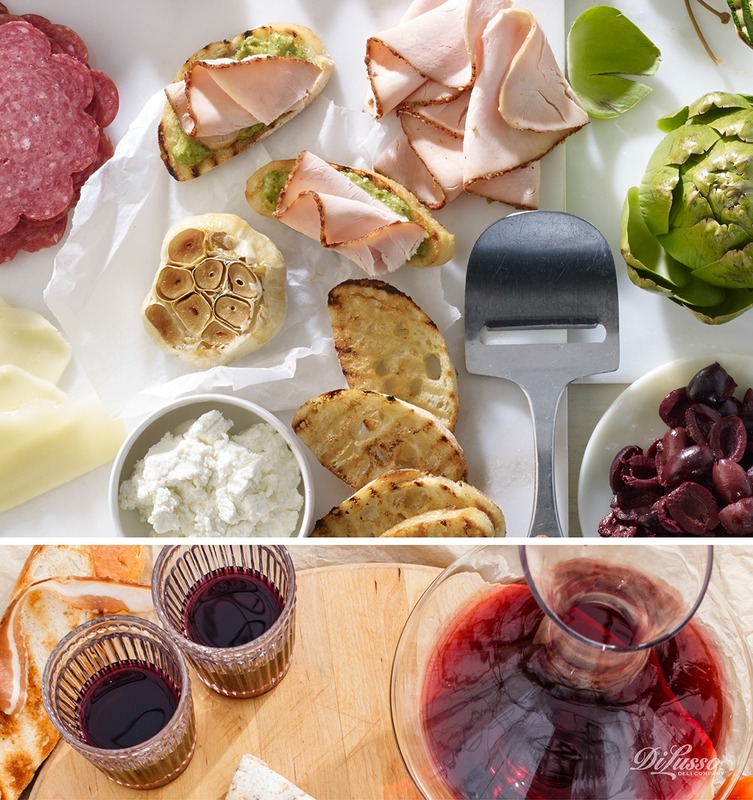 On it, we’ve arranged toasted baguette slices, bowls of DI LUSSO® olives and spreadable goat cheese, along with DI LUSSO® Genoa and Dry salami slices, a roasted garlic bulb, chopped and fried DI LUSSO® Prosciutto, grilled zucchini slices, artichokes and caper berries and fresh herbs for garnish. Invite guests to make their own bruschettas from these ingredients—or offer your own combination of favorite meats, cheeses, and condiments. There’s really no right or wrong, as long as you offer a variety of tastes, textures, and colors. This is such an easy way to serve guests! Just have a stack of appetizer plates at the ready and let your friends have at it. Because it’s interactive, it invites conversation—and lively conversation is, after all, the most important part of a successful gathering. And they pair nicely with a variety of both red and white wines, so your guests can truly tailor their choices. Best of all, you can prepare your spread ahead of time so there’s no need to miss out on the conviviality you’ve so successfully created!